Blue Valley Northwest scored two fourth-quarter touchdowns to pull away from Blue Valley Southwest in a 28-10 win on Thursday night. Running back Miles Alexander rushed for 258 yards and three touchdowns on 22 carries to lead the Huskies. Blue Valley Southwest scored with around 30 seconds remaining in the game to cut in to Northwest’s 28-3 lead. Manhattan rolled Topeka West 42-7 to remain unbeaten and stay in a tie with Topeka High atop the Centennial League standings. The Indians rushed for 334 yards on 35 carries and four touchdowns in the win. The Derby Panthers used a 31-point second half to turn a seven-point lead into a 45-14 rout over Newton on Friday. The Panthers now have won four straight games after an opening week loss to Maize. Although Liberal scored the game’s first points, Garden City did not let that stop them from scoring the final 52 points en route to an easy 52-6 win. The Buffalos took advantage of 130 penalty yards, some of which came at crucial points of the first half to take a 28-6 halftime lead. J.D. Woods rushed for 165 yards and two touchdowns as Lawrence won at Shawnee Mission South 19-7 on Thursday night. After the Raiders scored an early touchdown and recovered a Lawrence fumble, the Lion defense tightened and shut down the South running game. Lawrence held SM South to around 35 rushing yards on 18 carries for the game. Wichita Heights bounced back after its loss to No. 1 ranked Bishop Carrol last week with a 23-13 wins over Wichita East. Rodney Murphy scored two touchdowns and rushed for 93 yards, while Trenton Autry led all rushers with 177 yards. Heights improved to 4-1 on the season with the win. Connor Byers hit Hayden Hoffine on a 9-yard touchdown pass in overtime to lift Bonner Springs to a 31-24 overtime win over No. 4 KC Piper. Piper’s Travon Jones broke a 61-yard touchdown to break a 24-24 tie but was negated after a penalty. In overtime, the Braves scored first and held Piper on fourth-and-goal from the 4-yard line to preserve the win. Emporia escaped with a 9-7 road win over Shawnee Heights on Friday by forcing seven fumbles. Heights’ last fumble proved to be the most costly as T-Birds wide out Malik Stanley took a Camden Wheatley pass 38 yards downfield before fumbling inside the Emporia five yard line with just second left remaining in the game. The Baldwin Bulldogs tipped away a Louisburg 2-point conversion with 3:44 remaining in the game, preserving the Bulldogs’ 20-19 win. Baldwin sealed the game after recovering a Louisburg muffed punt with 1:14 to play in the game. Bulldog senior Tiler Garcia scored from 2 yards out to ultimately give Baldwin the game-winning touchdown. Paola’s Jake Robison scored on 4th-and-goal from inside the 1-yard line as time expired to help Paola beat Ottawa 20-14 on Friday night. Ottawa had a 14-6 halftime lead but Paola’s defense stood stout throughout the entire second half as the offense had just enough time to score the game-winning touchdown. The Panthers improved 4-1 on the season and have now won four straight after the dramatic win. Chanute Blue Comet quarterback Kenton Richards threw for 287 yards and rushed for another 77 yards for total of six touchdowns as Chanute earned its second road win of the season, 50-26, over Independence. Ian Rudzik rushed for 324 yards and seven touchdowns on 13 carries as Ulysses blasted Goodland 73-33. The Tigers led 67-19 at halftime as younger players saw a lot of action in the second half. Rudzik has now rushed for 1,113 yards and 16 touchdowns on the season. The Wichita Trinity defense forced five turnovers en route to a lopsided 38-7 win over Cheney. Tyler Burns rushed for 160 yards and three touchdowns and quarterback Matt Jones threw for 178 yards and two touchdowns and rushed for another. Osawatomie used the ground game to lead to a 48-0 shutout win over Anderson County. The Trojans rushed for 422 yards and five scores led by 283 yards and three scores from junior Riley England. Clinging on to a 14-6 lead with seconds left in the game and Clay Center inches away from scoring a potential game-tying touchdown, the Wamego Indian defense stopped Clay Center for a goal line and game-saving stand. Wamego took advantage of a Tiger fumble as Ethan Thomas scooped and scored for the first touchdown of the game and ultimately the biggest play of the game. Riverside defeated Royal Valley 37-6 behind a big night from senior quarterback Andrae McGaughy. McGaughy rushed for 225 yards and two touchdowns and passed for 129 yards and two more scores to lead the Cyclones. McGaughy tossed touchdown passes to Mason McCall and Grant Shue as the Cyclones improved to 3-2. Russell scored 28 points in the first half in rolling past Southwestern Heights, 42-14. The Broncos did all of their damage on the ground in rushing for 345 yards. Sophomore Grant Murphy led Russell with 123 yards on 18 carries, while Kiefer Craig carried eight times for 109 yards. Quarterback Reshean Holloway added 74 yards rushing and a pair of touchdowns. Maur Hill-Mount Academy suffered its first loss of the season on Saturday, 13-12 to Christ Prep Academy. The Ravens led 12-7 late in the game before Christ Prep’s Tanner Metzdorf hit Chase Stamatis on a 3-yard touchdown pass on fourth down to take the lead. Maur Hill-Mount Academy travels to unbeaten Horton in Week 6. Wellsville knocked Santa Fe Trail from the ranks of the unbeaten with a 12-6 win. The Eagles and Chargers were tied at 6 at halftime, but Wellsville rode a strong defense to the victory. Wellsville held the Charger offense to only 89 total yards and zero points. Santa Fe Trail’s only points came on a 45-yard interception return for a score by Daniel Courtwright. Doniphan West scored a touchdown in every quarter in beating Maranatha Academy 26-7 to earn its first win. Wade Joyce rushed for 133 yards and two touchdowns on 19 attempts to lead the Mustangs. Freshman Levi Watts connected on 3 of 4 passes for 26 yards and a touchdown. Lane Spiker added 110 yards on the ground for Doniphan West. Valley Heights built a 21-6 halftime lead, but needed two fourth-quarter touchdowns to get past Valley Falls. The Dragons outscored the Mustangs 16-0 in the third quarter to turn a 21-6 deficit into a 22-21 lead heading into the final quarter. Keaton DeWalt scored two rushing touchdowns for the Mustangs, while Logan Woodyard rushed for 165 yards and a score. Elkhart scored 20 points in the first quarter in rolling past Sublette, 37-7. Sophomore quarterback Tyler Sklenar passed for 182 yards and two touchdowns on 12 of 19 attempts to lead the Wildcats. He connected with Izzy Barco five times for 120 yards and a score. Tanner Burnett carried 32 times for 161 yards and two scores for Elkhart. Donovan Read rushed for 205 yards and two touchdowns as Northern Heights topped Yates Center 34-8. Trent Burd added 106 yards and two scores on 13 carries. Oberlin-Decatur Community picked up third district win by beating Logan-Palco 56-6. The Red Devils expanded a 24-6 halftime lead by outscoring the Trojans 32-0 in the second half. Bryson Wesley rushed for 118 yards and three touchdowns to lead Oberlin. Pratt-Skyline improved to 4-1 with a 52-0 halftime shutout of Macksville. The Thunderbirds got rushing touchdowns from Rance Tucker, Daniel Hacker, and Levi Johnston. 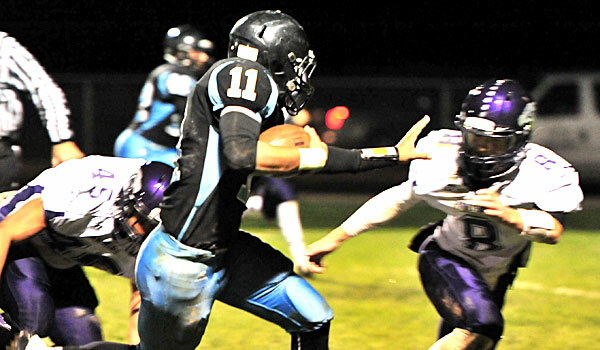 The T-Bird defense forced six turnovers and scored three touchdowns. Tucker and Dustin Weber each returned interceptions for touchdowns, while Brady McComb returned a fumble for another score. West Elk outscored Sedan 16-6 in the fourth quarter to pull out a 50-46 road win. The Patriots trailed the Blue Devils 18-14 at halftime and 40-34 entering the fourth quarter. Junior Armando Gomez rushed 39 times for 205 yards and two touchdowns to run his season total to 781 yards and 13 scores. Quarterback Damon Wilson passed for 168 yards and two scores for West Elk. Atwood-Rawlins County built a 30-0 halftime lead in rolling over St. Francis, 44-8. The Buffs were led by sophomore Cole Sramek and senior Macrae Migchelbrink on the ground. Sramek rushed 30 times for 142 yards and three touchdowns, while Migchelbrink added 138 yards and two scores on 19 attempts. Deerfield picked up its first win of the season by beating Rolla 52-14. The Spartans scored in each quarter including a 28-0 halftime lead. The victory was just the Spartans seventh in the past four seasons. Minneola scored 64 points in the first half, including 44 in the second quarter, in beating Fairfield 72-26. Quarterback Joey Harrington rushed 19 times for 333 yards and six touchdowns and passed for 92 yards and three more scores. Harrington has rushed for 918 yards and 18 scores this season. Axtell scored 30 points in the second quarter to take control in a 62-28 win over Frankfort. Eagle quarterback Colton Buessing completed 23 of 30 passes for 365 yards and six touchdowns. Buessing hooked up with Shane Talbot nine times for 128 yards and two scores, and Adam Kuckelman three times for 107 yards and two scores. Jacob Meybrunn also had five receptions for 81 yards and a touchdown. Frankfort was led by Jase Suther’s 93 rushing yards and a touchdown. Argonia-Attica dominated Caldwell 38-8 in the first half en route to a 60-38 district win. The Titans moved into the driver’s seat in 8-Man II, District 4 with the win. Alec McDaniel passed for 214 yards and four touchdowns, and rushed for 172 more yards and five scores. Devon Newberry added 96 yards rushing and a score. Five different Titan receivers caught passes led by Garrett Wells’ five receptions for 83 yards and two touchdowns.